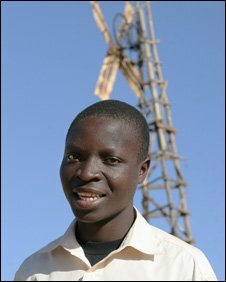 In the African country of Milawi, teenager William Kamkwamba transformed his village by building an electric windmill out of junk. One day he picked up a tattered textbook and saw a picture of a windmill. “I was very interested when I saw the windmill could make electricity and pump water. I thought that maybe I should build one for myself’, said William. After spending time scouring rubbish tips, William built a turbine from plastic pipes, spare bicycle and tractor parts. The finished product was a 5 metre tall windmill linked up to a car light bulb. As the blades began to spin in the breeze, the bulb flickered to life and a crowd of astonished onlookers went wild. Soon William’s 12-watt wonder was pumping power into his family’s mud brick home. Against all odds, William’s junk windmill worked. It powered light bulbs in his family’s home and later was able to charge mobile phones.